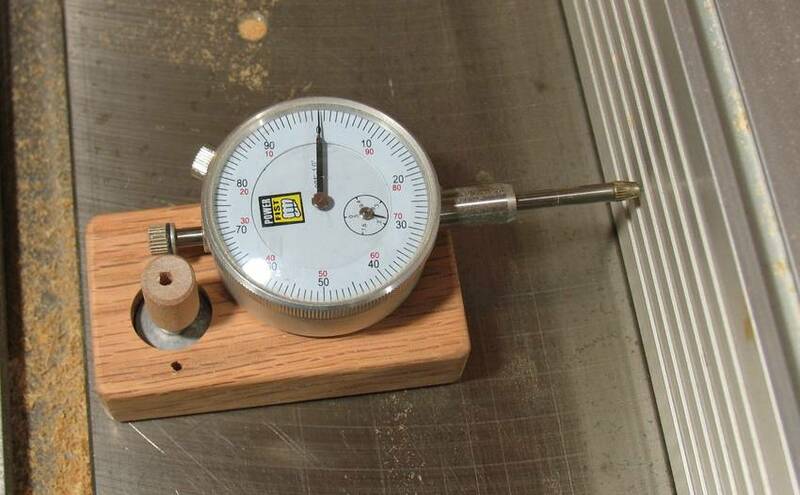 A dial indicator is all you need to adjust the fence to .001"
From time to time, people have suggested I do an article on building a table saw fence micro adjuster. But I do well enough adjusting the fence just with my fingers, so I have never had a need for such a thing. 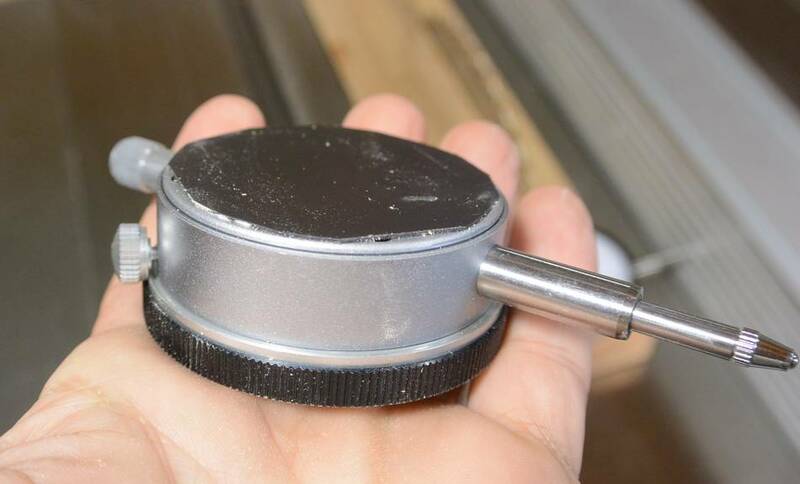 My table saw fence actually came with a rack and pinion adjuster knob on the fence, but I bumped and snagged it so many times that I took it off. So suppose we just ripped a piece of wood, and it turns out to be 0.970" wide, but we actually want it to be 0.950" wide. If I can move the fence by exactly .020" to the left, and make very consistent rip cuts, the next cut should be 0.950" wide. A dial indicator is useful for checking how much the fence has moved. I'm doing this in thousandths of an inch because my dial indicator uses that. It's hard to get a metric one in Canada, and I don't like the digital dial indicators. The fence on my table saw is decent, but not a particularly good one. I'm using my left hand to move it, while pressing it forward against the rail with my right hand to make sure it stays square. Watching the dial indicator, I can see if I moved it the right amount. Sometimes locking the fence causes it to move by as much as .002", but then I just unlock it, position it again and re-lock. Now making the cut again. 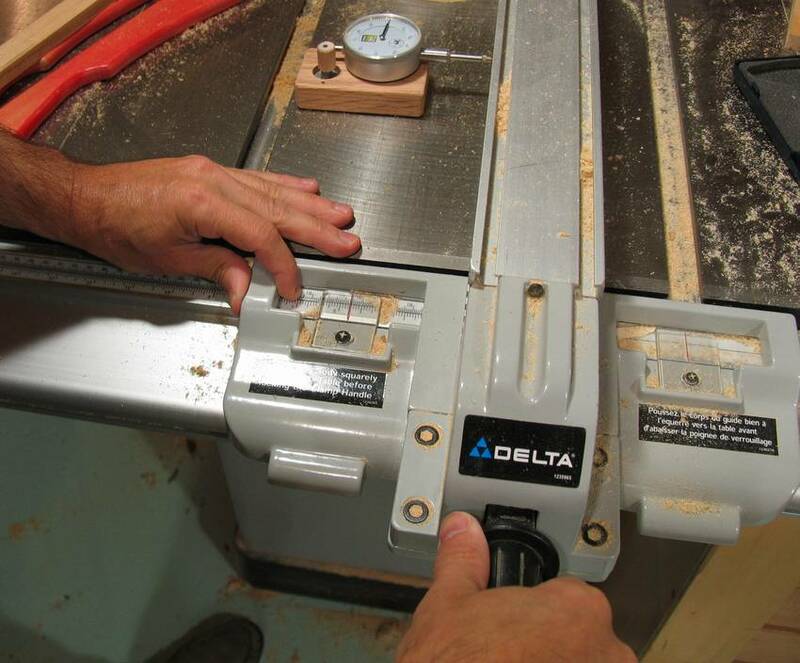 The tricky part is to make sure the ripping is done consistently. When only one side of the blade is cutting the board, that actually deflects the blade to the side a bit. I also made the previous cut with only the side of the blade cutting to be consistent. The other alternative, when cutting many pieces, is to just measure the previous work piece and adjust for the rest of the work pieces. For thin stock, its also important not to raise the blade much higher than the stock. 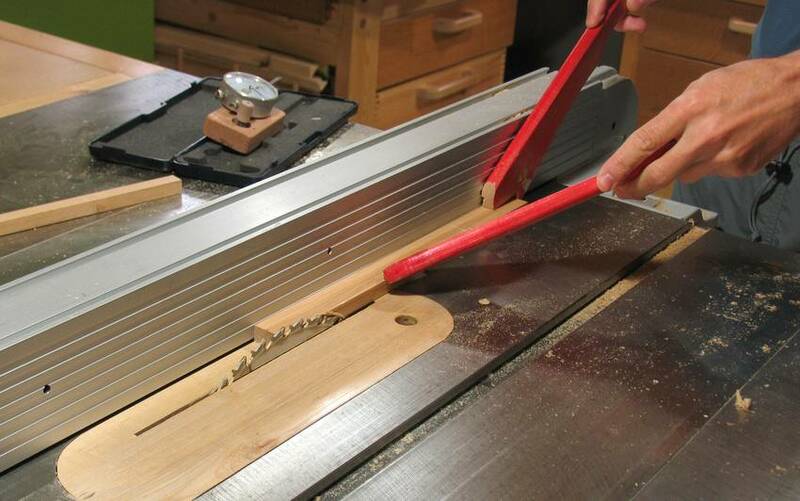 The more of the blade's teeth are in the wood at the same time, the more it cuts down on blade vibrations. Checking the final cut. It varied from 0.950" to 0.9515", a .0015" variance (about 0.04 mm). Close enough for woodworking! 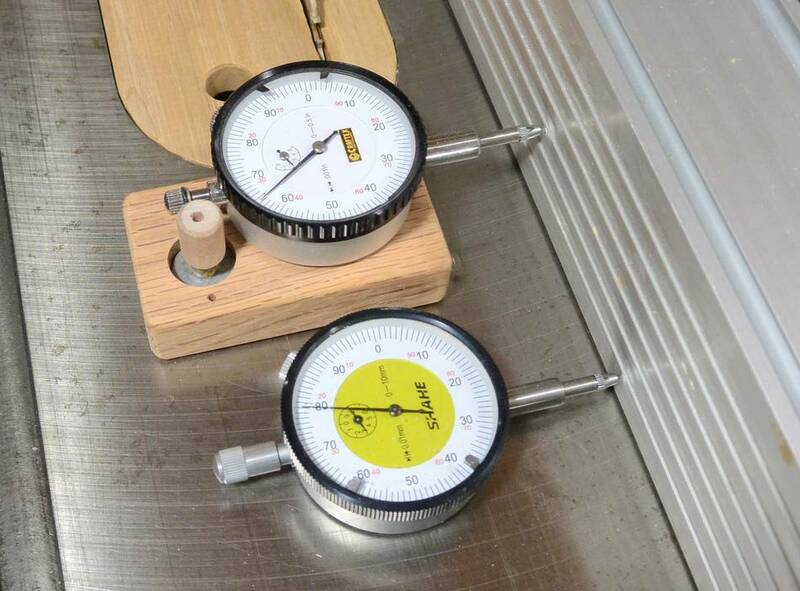 You can also use a regular dial indicator and magnetic base to measure the fence displacement, although arranging it for that sort of measurement is awkward. It was useful to try out the concept though. 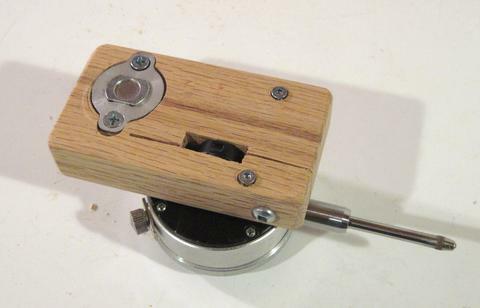 I used a magnetic door catch in a block of wood to hold the dial indicator. Lee Valley Tools sells these as "On/Off magnetic latches". It's barely strong enough, and I put two wood screws in the block of wood on the other side to make sure it would stay level. The magnet is barely strong enough for the job, not strong enough to hold it level on its own. 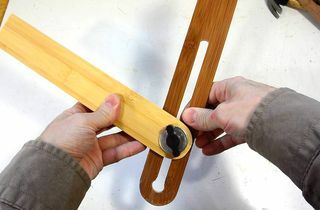 One of those bigger stronger magnets meant for feather boards and other jigs would have been better, but those cost much more. This little magnet only cost $10. 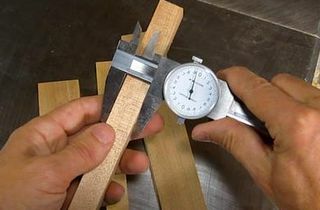 I don't often need cuts to be this precise, usually, just measuring between the fence and saw blade with a caliper is good enough, as I demonstrated in this article. There is, of course, wood movement from humidity changes to contend with, but it helps to be able to match the dimension of another piece exactly, even if they will both slightly change in size later. A reader pointed me to a source of metric dial indicators online. So I ordered one, and planned to mount it in my little dial indicator base. But when I got it, it didn't have a mounting loop on the back. I thought of using double sided tape to mount it, but then I had a simpler idea. I cut up a fridge magnet to cover the back of it, and then used glue-stick to attach the magnet to the back of the dial indicator, magnet facing outwards. The fridge magnet is not very strong. 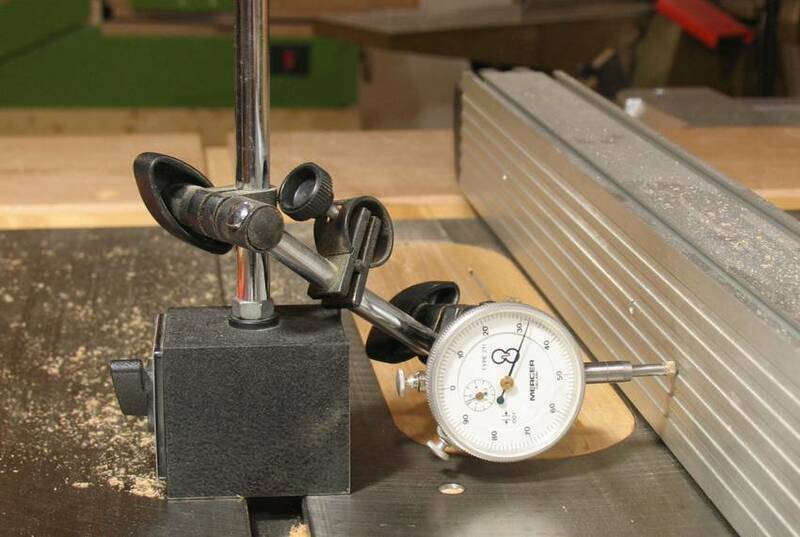 It will almost hold the dial indicator on a vertical surface without slipping. But I really don't need it to hold that well. All I need is for it to not slide around when I push the fence up against it. I don't even need to worry about whether it stays put while the saw is running because I place it temporarily to make a fence adjustment. I actually like this solution better than my other dial indicator holder now. The main caveat with this dial indicator is that the increments on the dial are 0.01 mm, which is 2.5x smaller than 0.001 inch increments on the other one. Being obsessive as I am, I want that needle on the right increment mark. 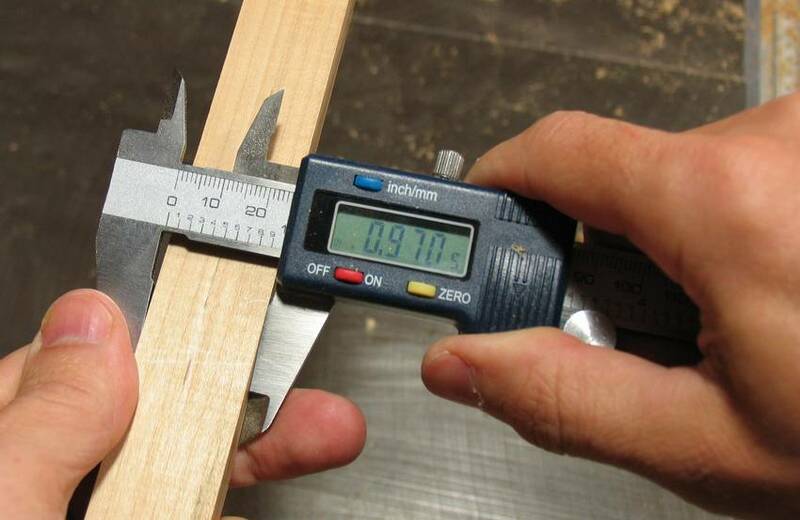 But it's much harder to set the fence to 0.01 mm than it is to 0.001" (or 0.025mm). 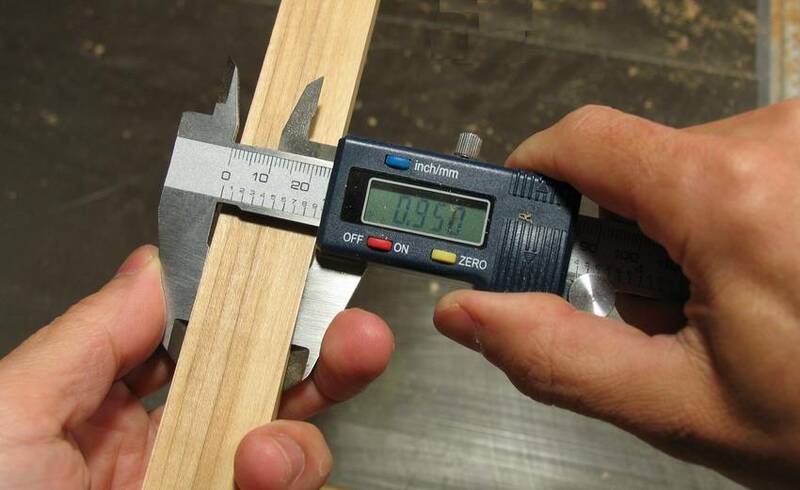 And 0.001" would be more than close enough for wood working.